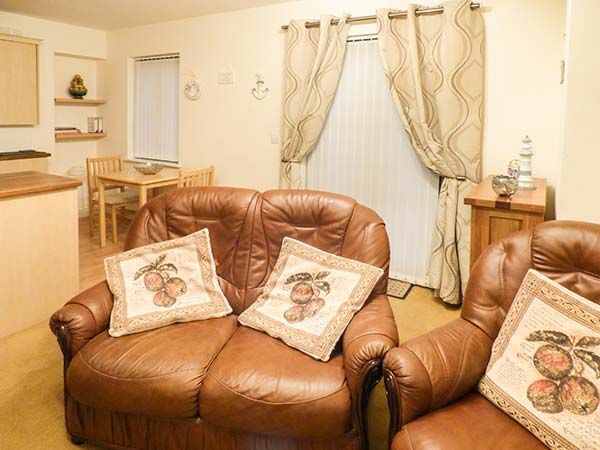 4 Chandlers Yard is a well-presented ground floor apartment situated on the outskirts of Burry Port in South Wales and can sleep two people in one double bedroom. There is a separate bathroom. The rest of the apartment consists of an open plan living area with kitchen, dining area and sitting room. to the outside of the property there is off road parking for one car and a front lawned garden with furniture. With the shop, pub and beach within a three minute walk, 4 Chandlers Yard will suit a couple looking to enjoy a coastal break. Amenities: Gas central heating. Electric oven, gas hob, microwave, fridge, freezer, washer/dryer, TV with Freeview, DVD, CD/radio, WiFi, selection of books, games and DVDs. Fuel and power inc. in rent. Bed linen and towels inc. in rent, please bring own beach towels. Travel cot and highchair. Lockable bike storage. Off road parking for 1 car plus additional guest parking. Shared bike storage. Front lawned garden with furniture. Sorry, no pets and no smoking. Shop, pub and beach 3 mins walk. Note: As this property is all on the ground floor it may be suitable for the less mobile, please contact the owner for more information. Note: Check-in 5pm, check-out 12 noon. Town: Burry Port is perfectly located on the beautiful South Wales coastline and has a selection of shops, a Post Office, several pubs and restaurants. The golf club is renowned for offering all year round sport no matter what the weather throws at you and the sandy beach is equally delightful on hot summer or wild stormy winter days. The harbour is a hive of activity where you can sit and watch or take an active part on boat trips out to sea. Gas central heating. Electric oven, gas hob, microwave, fridge, freezer, washer/dryer, TV with Freeview, DVD, CD/radio, WiFi, selection of books, games and DVDs. Fuel and power inc. in rent. Bed linen and towels inc. in rent, please bring own beach towels. Travel cot and highchair. Lockable bike storage. Off road parking for 1 car plus additional guest parking. Shared bike storage. Front lawned garden with furniture. Sorry, no pets and no smoking. Shop, pub and beach 3 mins walk. Note: As this property is all on the ground floor it may be suitable for the less mobile, please contact the owner for more information. Note: Check-in 5pm, check-out 12 noon. Well equipped and comfortable accomodation, very conveniently located for Burry Port town centre. highly recommended. Lots to see and do. A great flat. Very well equipped and really cosy. We were made very welcome by Chris and Meis. We would definitely recommend this property. Very close to coastal path and beach walks. We loved cycling through Pembrey park and visiting beach. Also the ride to Llanelli was great with a cup of tea and Welsh cake at the cafe on the way! Locals very friendly. A great stay. Thank you.